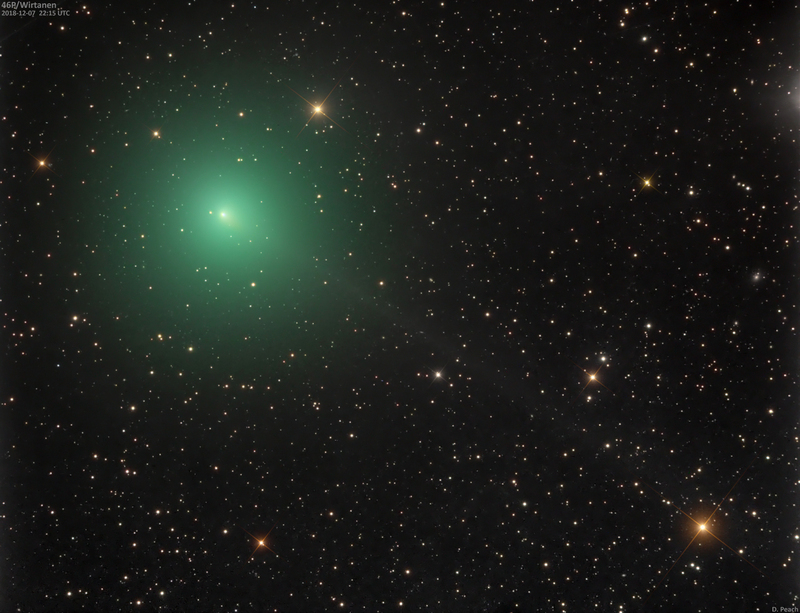 Comet 46P/Wirtanen is a short period of comet taking just 5.4 years to complete its orbit around the sun, it is rarely in astronomers' interests. It is a small comet with a nucleus of about 1.2km compare to that Comet Halley which has a nucleus of about 15km long. The comet on this orbital run has sparked up interest because on the 16th December, it will come within 7,260,000 million miles of Earth and will put on its best show for several centuries, however it is still won't be a brilliant comet to the level of Hale-Bopp but it should be easily seen with binoculars and possibly naked eye under ideal conditions. At closest approach, it will be ideally placed as it will be close the Pleiades or Seven Sisters and they will act as a signpost to locating the comet. The comet could appear as a fuzzy patch in the sky something like Comet Holmes did back in 2007 if members remember that comet. The cometary coma could be twice the size of the full moon at closest approach, however the light will be diffused. Magnitude predictions for the comet suggest 3-4 at best. The comet will be on view for much of the winter as it heads into the north polar region of the sky. It makes a very close approach to the brilliant star of Capella around Christmas Eve. Here's hoping for clear skies at closest approach. Clicking on the link included in that tweet http://www.damianpeach.com/deepsky/46p_2018_12_07dp.jpg reveals a larger image which makes me pine for the dark skies in the Lake District without the light pollution everywhere down here in the SE. Thanks for the info and image WH.